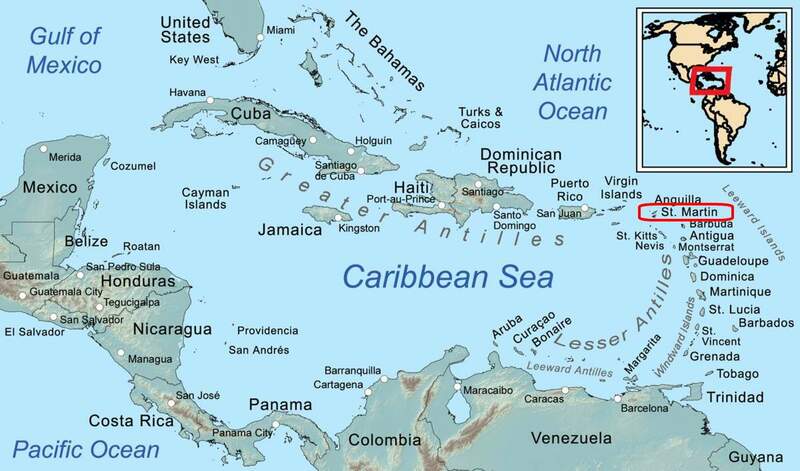 Wikipedia map shows the Greater Antilles at the north of the Caribbean sea, and the Lesser Antilles to the east. St Maarten at the north east. The small Caribbean island of French St Martin/Dutch St Maarten is located at the north-east of the Caribbean Sea – nestled between the Lesser Antilles to the south, and the Greater Antilles to the west. This is our third visit to St Maarten in as many years, and the second time preparing for a North Atlantic passage. St Maarten is a convenient stop for sailors planning to sail offshore. There are well-stocked chandleries, sail lofts, excellent supermarkets, riggers, electricians, a good variety of eateries, and many helpful people too if you need a hand with anything. To acquaint visiting sailors with what’s going on, each morning at 7.30am on VHF10, Mike from Shrimpy’s Laundry & Yacht Services hosts a cruisers net where visiting sailors can learn about social events, where to find local businesses, to buy/sell items, or to just say hello. Boats can either anchor on the French side, or the Dutch side, but you must check into whichever country you’re anchored in. Once ashore, you can move around freely between both countries. If there’s a northerly swell, anchoring on the French Marigot Bay is disastrous; similarly if there’s a south-easterly swell, the Dutch Simpson Bay is untenable. But there’s always the lagoon, accessible from the Dutch and French sides, but be prepared for a welcoming committee of thousands of barnacles after just a couple of weeks. View of Simpson Bay – looks nice from this angle! Obviously our biggest expense is the boat so it’s important we get the best prices on anything we need so that we can continue our sailing adventures. After researching online we usually find things much cheaper elsewhere and have them shipped. Despite St Maarten’s duty free status, some off-the shelf items here can still be more expensive than products from the UK or the US. One method I’ve used since I left Australia is to have a virtual mailbox in the US. Over the past few months I’d bought items for the boat so that when I arrived in St Maarten I consolidated the lot and had it shipped in one package. Local businesses are not forgotten though; chandleries, supermarkets, computer stores, restaurants, even our local shoe repair guy receives a good percentage of our sailing kitty! Large items from the US can be shipped directly to St Maarten. 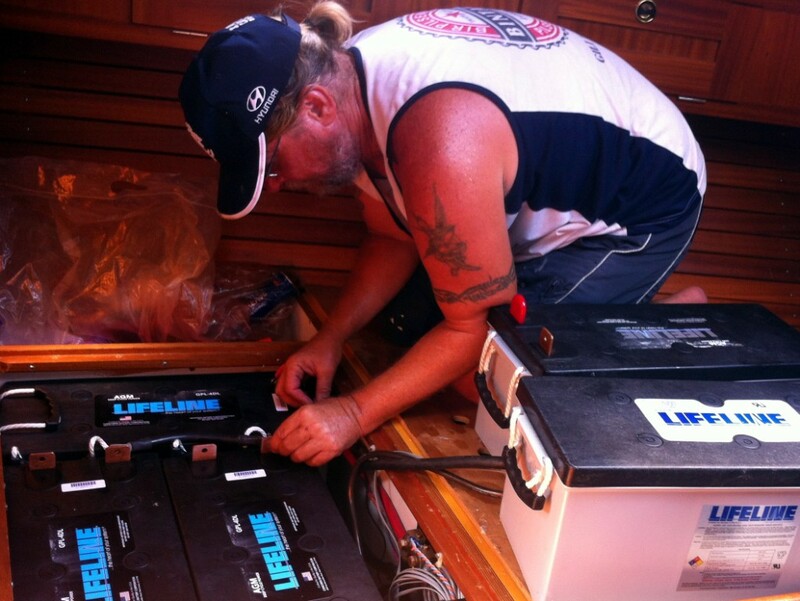 As was the case with the purchase of three new Lifeline AGM batteries direct from Miami. Including shipping we saved a substantial US$200 per battery. Sometimes though it’s impossible to buy things locally; such as Navionics e-charts for UK and Europe. But I managed to purchase these direct from the UK (cheaper than the US) and they arrived via UPS within four days. To install the new batteries and discard the old, we needed stability. So we berthed at the Simpson Bay Marina (inside the lagoon) for a few nights. The batteries arrived the following day, delivered in one huge 180kg bundle! Wayne split the package and we lifted each 60kg battery onto the back of the marina’s golf cart then back to Blue Heeler. Using a pulley system through the aft-cabin hatch, within an hour we had removed the old heavy batteries and Wayne wired up the new ones. Perfect! We were hoping to spend only a couple of days at the marina, but upon inspection of the wind pilot (which is our primary offshore steering method), Wayne decided to dismantle it and give it a good overhaul. Now it’s in good order for our voyage. I didn’t mind staying at the marina, as it was a treat to have the luxury of showers, toilets, and electricity for a few days. (And Burger King is across the road so I could easily grab a yummy ice-cream too!). For internet, it was recommended to us to purchase a Chippie data SIM card (from UTS on the French side). For only 10Euros, we have unlimited internet for two weeks. The strong signal works on both the French and Dutch sides of the island. Now in the evenings, if we’re not out partying at the local nightclubs (ha!) we can watch online movies, documentaries, news shows, and research heaps of sailing stuff without worrying about blowing our gigabyte limit. Very impressed with Chippie! Lagoonies Bar: Mark and Mike share their ocean crossing experience. Now we’re back out in Simpson Bay’s cleaner water where we can swim and use our watermaker, and our hull is remaining relatively clean. Socially, now and again we’ll catch up for drinks with friends at Lagoonies bar, have a meal at cheap’n’cheerful Pineapple Petes or the Pizza Galley. One afternoon, to help cruisers prepare for their impending ocean crossings, a couple of sailors talked about their experiences crossing the North Atlantic to Bermuda or the Azores. A surprising number of people went along, so it looks like this year will have many sailors heading for Europe and Bermuda. Storms still hanging around… we wait. It’s generally agreed that the best time to leave is after mid-May as the weather improves, with 1st June the official beginning of the hurricane season. Already though the first tropical storm of the season – T.S. 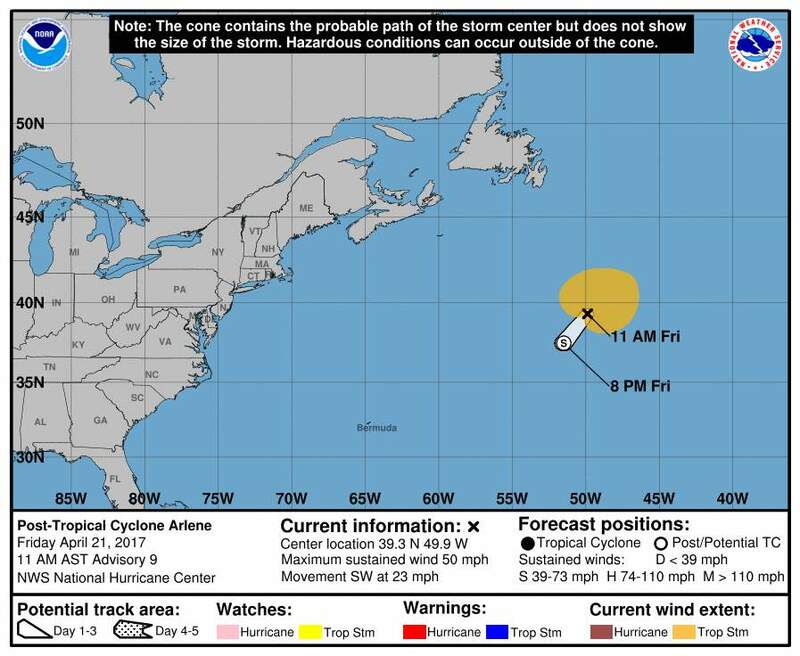 Arlene – appeared between Bermuda and the Azores. This was the highest and earliest on record, but already we can see the weather improving as we head into May. Fingers crossed! Two years ago we left St Maarten and sailed to Bermuda, then onto New York. We left in mid May/early June and had a reasonable trip with no bad weather. So with May upon us, in only a few weeks we will sail to the Azores then onto the UK. It’s important we get the timing right. So as we wait for optimal weather, we are making sure everything aboard Blue Heeler is ship-shape for the impending voyage. Aside | This entry was posted in 2017, St Maarten and tagged Caribbean, St Maarten, St Martin. Bookmark the permalink. Fingers crossed for a perfect weather window for the crossing to the UK. Good luck, prepare well, be safe, enjoy! Wishing you fair winds for your Atlantic crossing. We had so little wind around Tasmania that we motored most of the way on a gentle swell, even along the south coast! Thanks. Tassie was our training ground for cold rough weather so now we get to put it to practice. We may have to motor in the horse latitudes, but there’s nothing wrong with motoring! cheers!